Home » Blogs » Stephen Rockwell's blog » Office 365: But Wait, There's More! As can be see from the image above, there are now 3 enterprise version plans and 2 small organization nonprofit plans for Office 365. 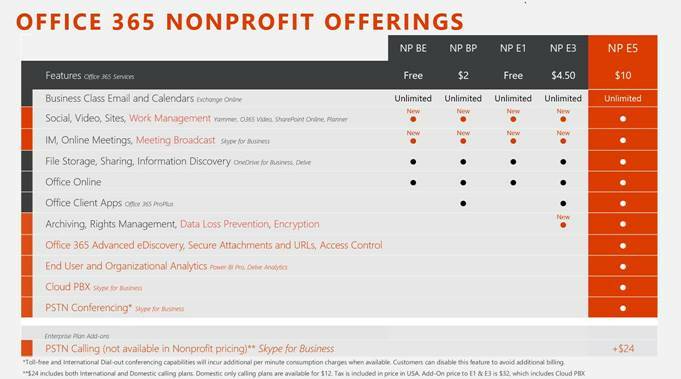 Microsoft unveiled nonprofit pricing for E5 on Monday, May 2 for $10/user/month, which represents a 70% discount off the corporate price of $35/user/month. As a comparison, the nonprofit E3 plan is $4.50 and the E1 plan is free. Skype for Business Telephony. There are a number of interesting features, but perhaps the most important new functionality is that the Skype for Business Cloud PBX and PTSN conferencing come with the E5 subscription. What does that mean? Users can be assigned a phone number to their Skype for Business (S4B) account that will allow them to place and receive calls on the public telephone network in addition to the Skype calls they can now make. A S4B phone handset can be bought or you can just use your computer and S4B software. There is an additional cost for the dial plan: $12/user/month for 3000 minutes for domestic calling and $24/user/month for 3000 minutes of international/domestic calling. PTSN conferencing means that each user get their dial in conference bridge that can be used with Skype for Business meetings. Power BI Pro and Delve Analytics - Most nonprofit user Microsoft's new business intelligence tool, Power BI, will be fine using the basic plan that is free for nonprofits. The E5 subscription covers Power BI pro which allows for larger data sets and ability to consume live data from a variety of sources including on premise (non-cloud) based data. Delve analytics will IT administrators and end users greater insight into how users are leveraging the myriad of Office 365 tools and how they are collaborating. Click here for a link describing Delve Analytics. Azure AD and Information Rights Management - The E5 plan will help IT administrators take greater control over what their users can access in the cloud and a number of other security features. Significant Upgrades to SharePoint, Your Organization's Intranet. This past Thursday, May 5, Microsoft announced a series of upgrades and improvements to SharePoint that would take a number of posts to get through in detail. I will touch on the highlights. Mobile app and natively responsive. Microsoft is releasing an app that renders your SharePoint sites in an attractive mobile interface and an app that will allow you to access intranet resources on the go. Click here for more information. User Interface Improvements. Improvements include home page and navigation that allows users to find their sites quickly, a new authoring interface and back end structure that allows you to build responsive pages that should look great on any device, and improvements to the standard SharePoint design, which has never been all that visual appealing. All of the SharePoint features that you are used to such as file libraries, team sites, and site contents pages have all been updated. Flow, Business Process Automation. Flow combined with PowerApps is perhaps the most significant improvement in this upgrade. Many organizations use workflows and infopath forms in Sharepoint 2010/13 to automate business processes. The new flow architecture allows lay users to quickly enable business processes not just in SharePoint but across your on-prem and cloud infrastructure. For example, we could create a workflow involving salesforce.com so that when a new contact owned by a particular fundraising staff person is created in salesforce.com, it could automatically populate a SharePoint list that fundraiser may be working offf of to track their touchpoints. We could also set that workflow based on a trigger such as the contact made a donation. Learn more about Flow. Power Apps. Based on a flow, we might also build an app that can be used within our organization either as an App in an Office 365 or a mobile app that we can download. PowerApp is an impressive tool that allows our business process automation to be initiated on a mobile device on easy to use app. Learn more about Power Apps. Improved Hybrid Functionality. If you have an on premise SharePoint environment the SharePoint 2016 upgrade allows you to better integrate to take advantage of cloud features. Click here for more information. This is a topic I will likely revisit in greater detail as I start using some of these tools. I don't think I have ever said I am impressed with SharePoint, but I may be ready to do so. Click here to learn more about all of these SharePoint improvements.